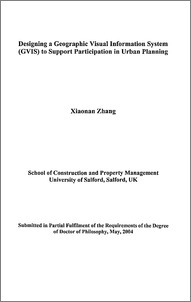 Zhang, X 2004, Designing a geographic visual information system (GVIS) to support participation in urban planning , PhD thesis, University of Salford, UK. The growth of the international movement to involve the public in urban planning urges us to find new ways to achieve this. Recent studies have identified information communication technologies (ICT) as a mechanism to support such movement. It has been postulated that integrating geographic information system (GIS), virtual reality (VR) and Internet technologies will facilitate greater participation in planning activity and therefore strengthen and democratise the process. This is a growing area of research. There is, however, concern that a lack of a theoretical basis for these studies might undermine their success and hamper the widespread adoption of GIS-VR combination (GVIS). This thesis presents a theoretical framework based on the Learning System Theory (LST). ICT technologies are then assessed according to the framework. In the light of the assessmenta, prototype has been designed and developed based on a local urban regeneration project in Salford, UK. The prototype is then evaluated through two phases, namely formative evaluation and summative evaluation, to test the feasibility of the framework. The formative evaluation was focused on evaluating the functionality of the prototype system. In this case, evaluators were experts in IT or urban planning. The summative evaluation focused on testing the value of the prototype for different stakeholder groups of the urban regeneration project from local residents to planning officers. The findings from this research indicated that better visualization could help people in understanding planning issues and communicate their visions to others. The interactivity functions could further support interaction among users and the analysis of information. Moreover, the results indicated that the learning system theory could be used as a framework in looking at how GVIS could be developed in order to support public participation in urban planning.